It was getting to be late Friday afternoon and I had no ideas for Feline Friday so I just started snapping. 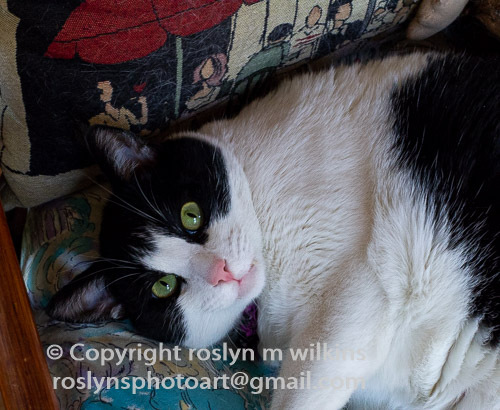 Freddie was on his favorite chair and decided to let me take a portrait. He has a very photogenic pink nose. Frankie was curled up on the sofa and refused to open his eyes for me despite my spot on imitation of a squeaking mouse. He was probably dreaming about mice anyway. I had to run a quick errand. By the time I returned home both cats had changed locations. 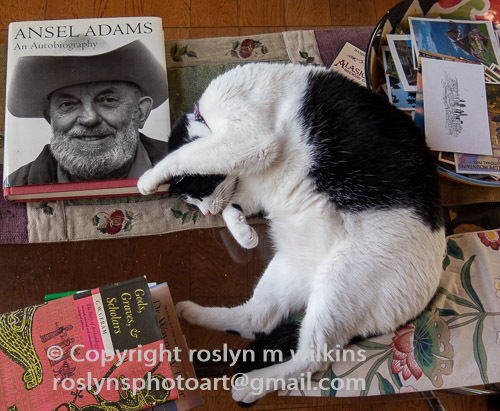 Freddie was on the coffee table cosying up to Ansel Adams and was done with posing. Frankie had taken up a position under the chair. Who says you have to sit on the cushions? This way he can rest and still have a good view of the room. The felines wish you a good week until next time! Categories: Animals, Cats, felines, Pets, Photography | Tags: Feline Friday, Frankie, Freddie | Permalink. Gosh they’re both so gorgeous. Happy weekend to you all. Freddie and Frankie thank you! LOL! The photo with Ansel is priceless, Roslyn. I laughed out loud! I like to think Mr. Adams would get a kick out of that photo! I get the part about having no idea what to post and just snapping. I will just wait instead til next week! Looks like Ansel likes cats! According to at least one source, he did love cats… and I saw a lovely photo of him with one of his feline friends! I’m sure your inspiration will return! I will do like you–just point and start shooting til I got something! Thank you! More likely passing dust balls in my house than a mouse! 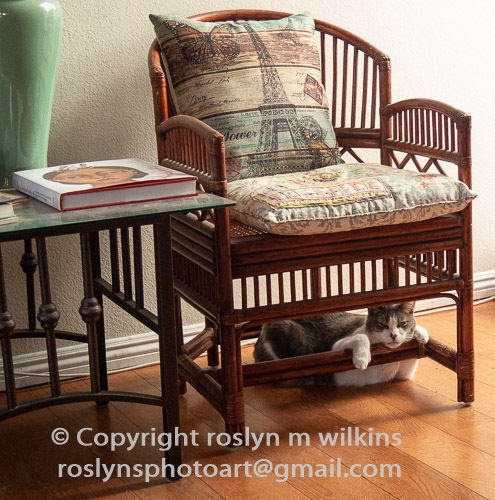 Great series of photos Roslyn, the one with Frankie curled up next to the Ansel Adams book, a classic. Wishing you a great ending to the weekend. Thanks, I like to think Ansel would be happy with that!